Handmade glass bead jewelry compositions by American glass artist Dianne Zack, featuring her handmade glass beads, semi precious stones, Hill Tribe fine silver, 23k vermeil and well-designed clasps. Playing with fire and melting colored glass is a meditative experience for me, an experience more about process rather than product. While making a beautiful bead is the intent, I have come to realize, and respect, that glass and its nature is sometimes unpredictable, so I approach each bead as an opportunity to learn something new. The design process draws on impulse, inspiration, and my love of color, texture and the beauty of natural materials. Some designs take time to hone, and others just seem to happen by themselves. In either case, I aspire to have the finished piece reflect my intent to honor the skills I've been given. I offer my deep gratitude to my friend Lynn Strolin, who introduced me to the joys of beadmaking, and to those people who have generously supported my work over these long years. Thank you. GALLERY FAVORITES Color, texture and whimsey characterize this series of perennial favorite bracelets. 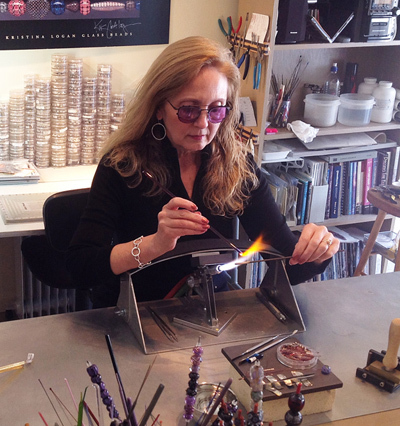 Each glass bead is individually handmade by Dianne in her Saratoga studio. Sterling silver, Hill Tribe fine silver and various semi precious stones or pearls further embellish the compositions. Average size of the bracelets is from 8 1/4" to 8 1/2". Larger or smaller sizes can be provided, a bench fee may apply. Pieces specified as 'Available as Shown' are available for purchase online, and ready to ship. Others will take 2 weeks to create for you. Pieces shipped within New York State are subject to 7% Sales Tax. Pieces are shipped via insured USPS Priority Mail. NECKLACES are also available in any of the Gallery Favorites designs. Handmade glass beads, sterling silver beads and toggle clasp, Hill Tribe fine silver spacers and signature tag. Approximate length 8 3/8". Handmade glass beads, sterling silver beads and toggle clasp, Hill Tribe fine silver spacers and signature tag. Approximate length 18 3/8". Handmade glass beads, sterling silver beads and toggle clasp, Hill Tribe fine silver spacers and signature tag. Approximate length 8 1/2". Handmade glass beads, Hill Tribe Fine Silver beads, heavy lobster clasp with chain, allowing adjustable length. Approximate length 8.25" to 9.25". Handmade glass beads, Hill Tribe Fine Silver beads, heavy lobster clasp with chain, allowing adjustable length. Approximate length 18"". Handmade glass beads, handmade acid etched beads, sterling silver beads and toggle clasp, Hill Tribe fine silver spacers and signature tag. Approximate length 8 1/4". Handmade glass beads, sterling silver beads and toggle clasp, Hill Tribe fine silver beads, spacers and signature tag. Approximate length 8 3/8". Handmade glass beads, Kingman Mine Turquoise, coral,sterling silver beads and toggle clasp, Hill Tribe fine silver spacers and signature tag. Approximate length 8 1/2". Handmade glass beads, sterling silver beads and strong magnetic clasp, Hill Tribe Fine silver spacers and signature tag. Approximate length 8 3/8". Handmade glass beads, sterling silver beads and Horseshoe charm, Hill Tribe Fine silver spacers,toggle clasp, and signature tag. Approximate length 8 3/8". Handmade glass beads, sterling silver beads, Hill Tribe Fine silver spacers, toggle clasp and signature tag. Approximate length 8 3/8". The RACE POINT SERIES has been a trademark of Dianne's designs since she first began making beads in 1999. Silver leaf is applied to the bead while hot, and small applications of clear glass embellish the surface, calling to mind the ocean's spray. Each design in this series includes small pebbles from Race Point Beach, at the National Seashore in Cape Cod. The stones are drilled and finished with a protective lacquer. Hill Tribe fine silver beads and clasps finish the compositions. All of the bracelet colorings are available as necklaces. All designs can be sized to your preference, a bench fee may apply. Handmade glass beads w/ silvered glass applications, stones from Race Point Beach, Hill Tribe fine silver beads, spacers, toggle clasp and signature tag. Approximate length 8 1/4". Handmade glass beads, stones from Race Point Beach, Hill Tribe fine silver beads, spacers, and signature tag, sterling silver toggle clasp. The opulent FLORENTINE SERIES is reminiscent of the Old World esthetic, finely detailed and lush with tones of gold. Each transparent colored bead is embellished with delicate tracery of high-content silver reduction glass, which when carefully manipulated in the flame, yields a rich metallic luster. A selection of the FLORENTINE SERIES features delicately hand-carved quartz beads, freshwater pearls or unusual semi-precious stones. Findings and metal beads are high-quality 23k gold vermeil. Finished length on the bracelets averages about 8 1/2". While the sequence of glass beads and style of vermeil beads will vary slightly from piece to piece. Designs shown here are available on an ongoing basis. Those available now are noted in the description, and others can be made for you. While the theme of the piece will be consistent, varieties in bead style and placement will vary. All designs can be sized as to your preference. A bench fee may apply. Handmade glass beads, carved quartz beads, 23k vermeil beads, spacers, clasp and signature tag. Approximate length 8 3/8". Handmade hollow and solid glass beads, carved quartz beads, 23k vermeil beads, clasp and signature tag, gold filled spacers. Approximate length 19". Handmade glass beads, carved quartz beads, 23k vermeil beads, toggle clasp and signature tag, gold fill spacer beads. Approximate length 18". Handmade glass beads with silvered glass scrolls, 23k Vermeil beads, clasp and signature tag, gold fill spacer beads. Approximate length 8 1/4". Handmade glass beads, handmade acid etched glass beads, 23k vermeil beads, toggle clasp and signature tag, gold-filled spacer beads. Approximate length 8 3/8". Handmade hollow and solid glass beads, quartz chunks, 23k vermeil beads, S-clasp and signature tag, gold filled spacer beads. Approximate length 17 3/4". There's something magical about pearls, especially when combined with carefully crafted glass beads. Unusual shapes, rich luster, and remarkable color are the hallmarks of the PEARL SERIES. Handmade glass beads, pearls, 23l vermeil beads, toggle clasp and signature tag, gold-filled spacer beads. approximate length 19". Handmade glass beads, pearls, 23k vermeil beads, toggle clasp and signature tag, gold-filled spacer beads. Approximate length 8 1/4". Handmade glass beads, heishi pearl chips, 23k vermeil beads, large toggle clasp and signature tag, gold-filled spacer beads. Approximate length 20". Handmade glass beads, pearls, 23k vermeil beads, toggle clasp and signature tag, gold-filled spacer beads. Approximate length 8 3/8". Handmade glass beads, pearls, 23k vermeil beads,toggle clasp and signature tag, gold-filled spacer beads.. Approximate length 18 1/2". This piece is available on a special order basis, please allow 2 weeks for me to make it for you. Pearl color may vary, but the essence of the design will remain consistent. Handmade glass beads, pearls, 23k vermeil beads, toggle clasp and signature tag, gold-filled spacer beads. Approximate length 18". The LIMITED EDITION SERIES features compositions using natural stones, fossils, and silver components all chosen for their distinct nature. Many of the stones are rare, or difficult to obtain, making the finished designs hard to replicate. The glass is made to harmonize, mirror or compliment the natural materials. Handmade glass beads, turquoise from the Kingman Mine in Arizona, coral, Hill Tribe Fine Silver, antique silver clasp, signature tag. Approximate length 18". Available as shown. Handmade glass beads, Mineshaft Basalt from the Upper Michigan Peninsula carved by lapidary artist Gary Wilson, Hill Tribe Fine Silver, antique clasp, signature tag. Length approximately 20". Available as shown. Handmade hollow and solid glass beads, fine silver, signature tag. Length approximately 19 1/2". Handmade glass beads, Hill Tribe fine silver, handmade S-clasp, signature tag. Approximate length 18 1/2". Available as shown. Handmade glass beads, hammered fine silver rings, sterling silver jump rings, lobster clasp, signature tag. Approximate length 8 1/2", adjustable. Handmade glass beads, hammered fine silver rings, sterling silver jump rings, lobster clasp, signature tag. Approximate length 8 1/2". Handmade glass beads, hammered fine silver rings, sterling silver jump rings, lobster clasp, signature tag. Approximate length 8 5/8". Handmade glass beads, hammered fine silver rings, sterling silver jump rings, lobster clasp, signature tag. Approximate length 8 3/8". The bracelets and necklaces shown below are available on a special order basis, feel free to contact me with inquiries. These designs are part of a limited edition portfolio; all have been sold, but a few of them can be replicated. Please feel free to inquire. Silver and glass...a lovely combination! These earrings are gallery staples, many colors are available.